Collection of the Sagadahoc History & Genealogy Room. The long and rich history of Sagadahoc County and its ten communities, a history still portrayed in current structures, road patterns and land uses, is the focus of the Sagadahoc History and Genealogy Room’s collecting mission. Following the melting of the last ice sheet, about 12,000 years ago, the area we now know as Sagadahoc County was inhabited by various Native American tribes generally called the Abenaki. Then, in the early 17th Century, European explorers, most notably Samuel de Champlain, sailed the coast of “Maine” and began to map it in detail, including the major bays and estuaries, such as the Kennebec River, then known by various names (e.g., Sagadahoc). 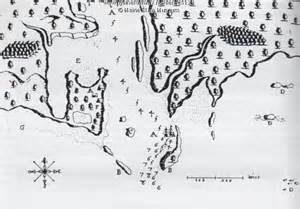 Samuel de Champlain’s Map of the Mouth of the Kennebec River. Initially part of York County, the area now known as Sagadahoc County became part of Lincoln County in 1760 and then its own county in 1854, thirty-four years after Maine became a state in 1820. Detail from the 1858 Map of Bath, Maine. Collection of the Sagadahoc History & Genealogy Room. Bath, along with the West Bath area, became its own town in 1781, shortly after separating from Georgetown as the Second Parish. Then, in 1847 Bath became a city, three years after West Bath became an independent municipality. In 1854, with the establishment of Sagadahoc County, Bath became the County Seat. Even before inclusion in Georgetown in 1738, the area we now know as Bath was attractive to early settlers because of the deep-water access to the ocean via the Kennebec River, especially along the 4-mile straight stretch known as Long Reach. One of those early settlers was Rev. Robert Gutch, who purchased much of the southern part of Bath in 1660. By 1760, much of “Bath” was divided into East-West, river-to-river segments owned by members of families that became significant contributors to the town’s history (e.g., Philbrook, Sewall, Donnell, Robinson and Crooker). Kennebec-River ferries in Woolwich. Detail of 1878 bird’s-eye map of Bath, Maine. Sagadahoc History & Genealogy Room. Shipbuilding was and still is the major industry in Bath, from early in the 19th century to the present-day incarnation of Bath Iron Works. In the time of sail, Bath once ranked as third in the nation in shipbuilding behind Boston and New York. 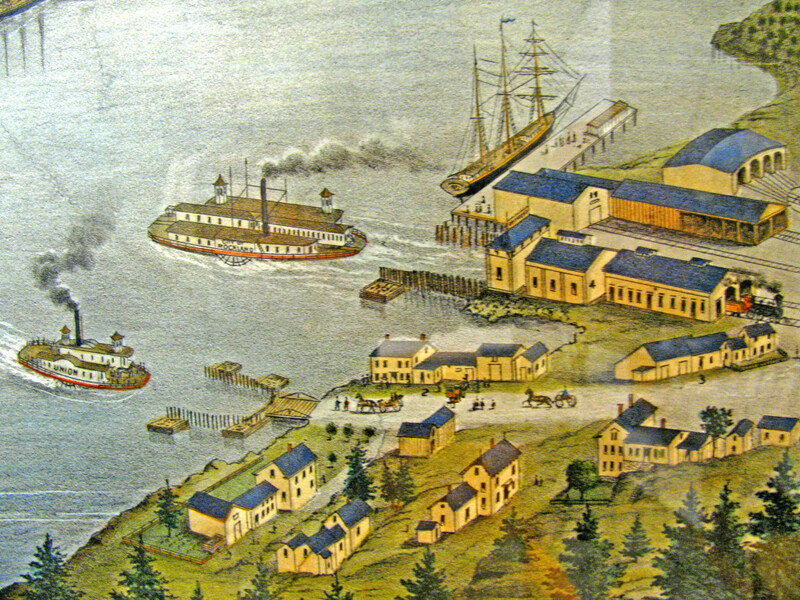 For example, in 1854 there were approximately 21 shipyards between Harward Street at the north end of Long Reach to Hospital Point at the south end. Bath Iron Works, started as Bath Iron Foundry by Thomas Worcester Hyde in 1865, thrives today as Bath’s only shipyard, revived by the demand for U.S. Navy vessels in WWII, after almost a decade of non-production in the late 1920s and early 1930s. Construction of the Carlton Bridge, Lee Abbott Postcard. Venus Crosby Collection, Sagadahoc History & Genealogy Room. While the Kennebec River has been the most significant factor in the economic growth of Bath, crossing this river became a serious problem as transportation by land became more important late in the 19th century. In the 18th century, hand/horse-powered ferries carried people and wagons across the river, particularly to Day’s Ferry in Woolwich. When the railroad came to Bath in 1849, it ended at the Kennebec until train ferries started in 1871. Ferries for people and horse-drawn wagons, and later automobiles, crossed from Bath to Woolwich well into the 20th century, to be terminated by the opening of the Carlton Bridge in 1927. 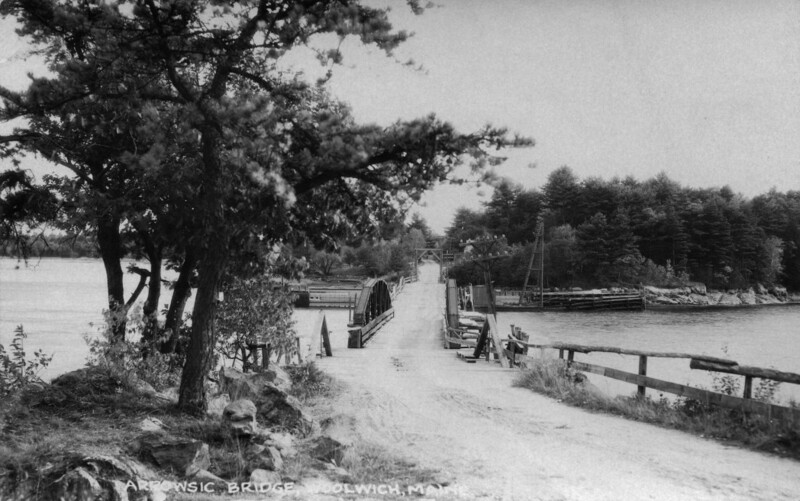 Today, the Carlton Bridge still carries trains, but in 2000 the Sagadahoc Bridge replaced it as the conduit for automobile traffic, which has become the major means of access to coastal Maine communities. The island of Arrowsic, first incorporated as the Town of Georgetown in 1716, became its own municipality in 1841. It was the last “town” to separate from the enlarged Georgetown, which had once also included the areas now known as Phippsburg, West Bath, Bath and Woolwich. Early on (1650s), the Clarke and Lake Company of Boston, erected a settlement (with a garrison) on the northeastern part of the island (Spring Cove and Mill Island), where the company conducted trading of local commodities such as fur and lumber. After that settlement was destroyed in a Native American attack in 1676, most residents fled the Kennebec region, with some returning to the island and other communities along the river, when peace was restored in 1678. The next Arrowsic settlement was Newtown in the southwestern part of the island, along the trade corridor of the Kennebec River, where, in 1717, Samuel Denny set up his home and a blockhouse. After its early commercial history as a trading site for local goods, Arrowsic enjoyed a moderately productive history in farming, lumbering and shipbuilding through the 19th century. Since its inception, Arrowsic has been the least-populated town in Sagadahoc County. Feldspar Quarry, Georgetown. Stinson Family Album, P. E. Bonner Collection, Sagadahoc History & Genealogy Room. Georgetown Island was originally called Parker’s Island, named for John Parker who purchased it from the Abenaki sachem known as Robinhood. As initially incorporated in 1716, the Town of Georgetown was only the island of Arrowsic; in 1738 Georgetown grew to include Parker’s Island, as well as the areas now known as Phippsburg, West Bath, Bath and Woolwich . That region divided into distinct municipalities, starting with Woolwich in 1759 and followed by Bath (including West Bath) in 1781, Phippsburg in1814, and finally Arrowsic in 1841. Because of its location at the mouths of the Kennebec and Sheepscot Rivers, Georgetown has had a rich history as a summer vacation site for wealthy Massachusetts and New York families, and a commercial history of fishing/lobstering and feldspar quarrying. A significant piece of Georgetown’s recreational history is Reid State Park, created in the 1950s from land donated by Walter E. Reid in the 1940s and 1950s. Interior Fort Popham. Postcard by W. H. Ballard, ca. 1950. P.E. Bonner Collection, Sagadahoc History & Genealogy Room. The area encompassed by the current town of Phippsburg was added to the original Georgetown (Arrowsic Island) in 1738 and then incorporated as a separate town in 1814. Originally its name was spelled with one “p” to be consistent with the spelling of its namesake, Sir William Phips, who was born in 1651, in the area we now know as Woolwich. Phippsburg is divided into a number of distinct villages or communities, including Parker’s Head, Popham Beach, Sebasco, Small Point, West Point and Winnegance. The European history of “Phippsburg” began with the temporary settlement of the Popham Colony in 1607. With the death of its leader in 1608, the remaining settlers returned to England on the Virginia, the first ocean-going ship built by colonists in North America. Shipbuilding on the Kennebec River and the lumber-producing tide mills at Winnegance were major commercial enterprises in Phippsburg, as was feldspar quarrying in the area of the Basin. The town also has a significant recreational history as the site of many hotels and resorts, the location of a major State Park at Popham Beach, and the continuing presence of numerous summer residents. New Meadows Inn, West Bath. Patricia Harcourt Collection, Sagadahoc History & Genealogy Room. The area now known as West Bath separated from Georgetown in 1781 to become part of the Town of Bath. In 1844, three years before Bath became a city, West Bath was incorporated as a separate town. The early settlers located along the Stevens River (i.e., New Meadows River) because most transportation was by water. Even before 1781, this area was known for its various mills, both sawmills and gristmills, particularly those of Joseph Berry at Mill Cove. A lesser-known but important enterprise was ice cutting, namely on Houghton Pond in the late 19th century. Farming was also a common means of making a living, Rosedale Farm on Foster’s Point road being the most well-known enterprise, operating from the late 19th century into the 1950s. From the late 19th century until well into the 20th century, West Bath was also the location of a relatively large number of inns and resorts, for example New Meadows Inn, Grand View House, Hotel Birchwood and Witch Spring Inn. Arrowsic-Woolwich Bridge. Postcard by Otis N. E. Card. Ada and Fred Haggett Collection, Sagadahoc History & Genealogy Room. Originally added to Georgetown in 1738, the area we know as Woolwich was the first to leave that town, becoming its own town in 1759. While shipbuilding was a significant industry in the late 18th century and through the 19th century, Woolwich was also a productive farming community, especially in the 19th century. For example, in almost every product category measured for the 1860 Agricultural Census for the State of Maine, Woolwich exceeded the combined totals for Arrowsic, Georgetown and Phippsburg. Topsham and Bowdoin are the only towns in Sagadahoc County that do not front on the Kennebec River. Topsham was named for Topsham, England in 1717 and was officially incorporated in 1764. Bowdoin, named to honor James Bowdoin, then Governor of Massachusetts, was incorporated in 1788. While a few ships were built in Topsham in the 18th and 19th centuries, the town’s industrial history centers on various kinds of mills along the Androscoggin and Cathance rivers. Land-locked Bowdoin has a rural history, largely as a farming community. In the 1850s, the Sagadahoc Agricultural and Horticultural Association was formed and land was purchased to house the Association and the Sagadahoc County Fair, which still exists as the Topsham Fair. Bowdoinham, named to honor Dr. Peter Bowdoin, an early proprietor, was incorporated in 1762. In 1823, the northern portion of the town was incorporated as the Town of Richmond. With significant frontage on Merrymeeting Bay and/or the Kennebec River, both towns have rich maritime histories, especially as shipbuilding communities in the 19th century.